This Patek Philippe Grand Complications 5004P is the iconic and world-famous reference 5004 with the platinum case. The watch was introduced in 1995, with only 12 pieces produced per year. After about 16 years Patek stopped production of the 5004 due to excessively high manufacturing costs. The rapid increase in demand for this watch was the result. The Reference 5004 is a watch with an iconic status and is considered by many watch collectors to be the "Holy Grail". The perpetual calendar takes into account not only the months with 31, 30 and 28 days, but also the leap day of 29 February, which occurs all four years. In the two apertures at 12 o'clock the day of the week or the month is displayed. The date is shown in the sub dial at 6 o'clock. The sub dial at 3 o'clock indicates the leap year. The small second with the 24-hour display is positioned at 9 o'clock. Moonphase is at 6 o'clock. 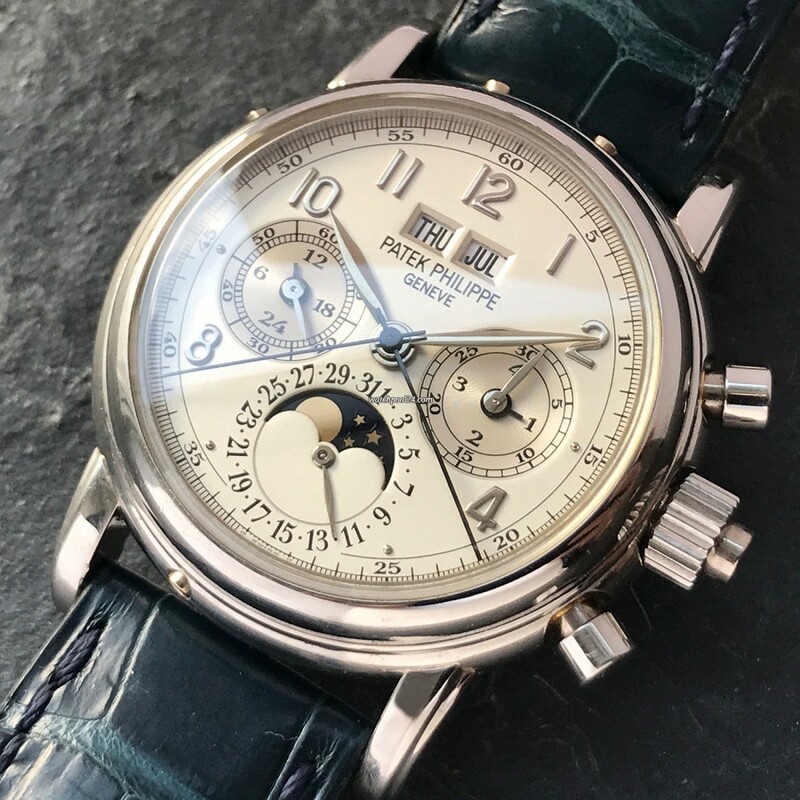 The Reference 5004 movement is based on the Lemania chronograph caliber CH 27-70 Q and is equipped with the complex modules (Perpetual Calendar, Moon Phase, split seconds) by Patek Philippe. The sapphire crystal caseback is installed and offers a beautiful view on the complicated movement. Additionaly a platinum case back accompanies the watch. This particular Patek 5004P is in excellent overall condition. The platinum case is unpolished, the Argente dial is absolutely flawless. A dark blue crocodile leather strap gives the watch a great touch. The folding clasp shows the beautiful Calatrava cross. In the collectors' circles, the Reference 5004 is considered one of the most iconic and important Patek Philippe models. This particular platinum example captivates by its excellent condition and the available full set.